Religion has a deep history in our species. People were being buried with grave goods before our species had colonised the globe, hinting at an ancient belief in the afterlife1. But whilst many religious ideas have an early origin, there’s growing evidence that “god” is a lot more recent. 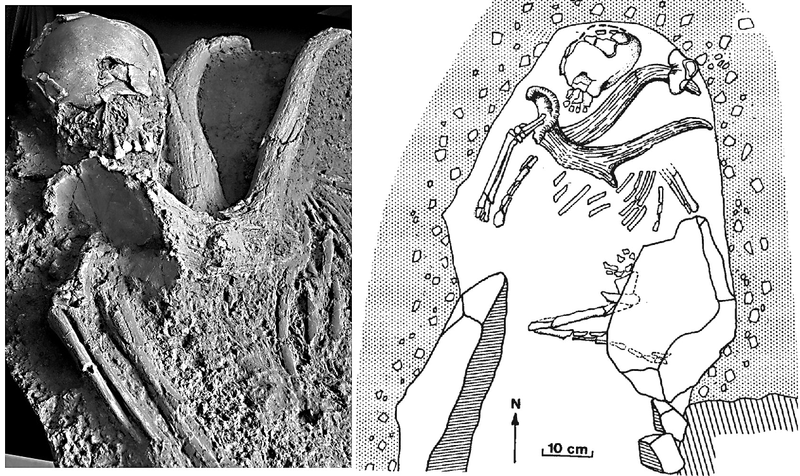 Qafzeh 11, a 95,000-year-old burial from Israel. This 13-year-old was interred with an impressive pair of deer antlers1. Maybe they needed to show off in the afterlife? Specifically, the type of moralising deity seen in most western religions. You know the kind, a busybody “Lord” that gets involved in the lives of mortals, issuing commandments and punishing wrongdoers. Well, it turns out they’re relatively rare, only see in ~1/3 of societies2. Anthropologists studying these societies have found several key similarities that hint at a common, recent, cause for their beliefs. Taken together, we’re figuring out who first started believing in a vengeful god, when it happened, and why these beliefs took off. Blue dots are societies with a moralising god. It turns most groups don’t like being bossed around3. I’m sure you’ve already figured out the answer to this paradox. That minority of societies have millions of members, inflating the apparent popularity of belief in a vengeful god2. It turns out their large size is also the first clue about how a god evolved. Back in the 60s, scientists found that there is a clear correlation between the two. Bigger groups are much more likely to have an active moralising god. Whilst 95% of societies with <1,000 members lacked this type of deity, they’re seen in almost half of groups with >10,000 people2. The chart for what I just said2. So it seems that the first people to develop a belief in a vengeful god lived in large groups. A big group requires a big god. Maybe their commandments help keep people in line, preventing people from exploiting the system. Or perhaps it fosters trade with religious neighbours. So, which groups were the first to cross this threshold and develop a moralising god belief? Who came up with god? Enter anthropologists Peoples and Marlowe, who wanted to drill down deeper. They used cross-cultural data on 178 different societies to look for other features groups with a vengeful god share, perhaps hinting at a deeper, underlying cause2. They found it wasn’t population size but co-operation that was the driving force. Moralising gods were more likely to be present in societies where a large number of people worked together in complex ways. Groups with social classes and/or farmers and/or pastoralists. It’s just large societies were simply more likely to have those traits2. Again, the chart for what I just said2. The first societies to experience these sorts of social demands, and thus foster the evolution of a moralising god, lived relatively recently. Around 10,000 years ago in the Near East groups started domesticating animals, leading to farming, pastoralism, and social stratification2. As such, these early farmers may have been the first to believe in a moralising god. Sure enough, we start seeing some of the first evidence for organised religion around this time. Things like alters and evidence of animal sacrifice, along with huge religious monuments2. 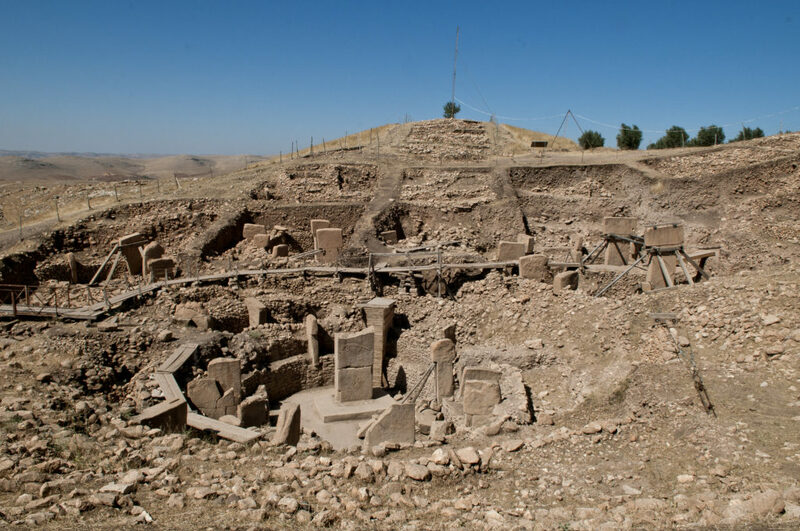 However, Göbekli Tepe was built before the invention of farming. This creates a chicken and egg problem Did big societies emerge because an existing belief in god made it possible? Or did the god come later, in response to the problems of living in great big groups? Chicken or egg – When did God evolve? To pinpoint when a belief in a moralising deity emerged, we need to figure out whether it enabled complex societies, or was a product of them. We can answer this simply by figuring out which came first. However, the data we have isn’t clear on the subject. When the Vikings experienced a rise in social complexity, it came after they were introduced to a moralising god. On the other hand, many Near Eastern sites show it happening the other way round4. So Whitehouse et al. began an exhaustive review of the data to try and answer this question once and for all. Rather than looking at limited case studies, like “what were the Vikings up to”, they examined more than 400 groups, tracking social complexity as a god evolved4. Consistently, they found that a moralising god came after society got more complex4. 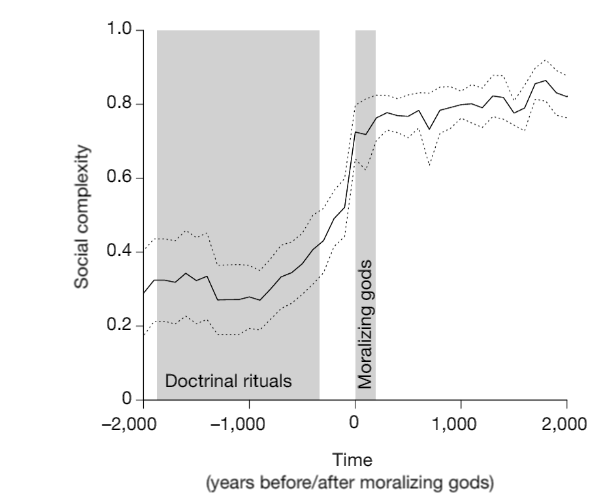 Another chart saying what I said, charting social complexity versus the advent of moralising gods4. As well as showing god came last, these figures also give an idea for the time scale involved; with it taking ~1,000 years of increasing social complexity before a moralising god shows up4. In written records, this first appears ~5,000 years ago in Ancient Egypt4. However, earlier evidence for social complexity, like the early farmers, show there are likely earlier examples of prehistoric vengeful gods. This potentially stretches back to Göbekli Tepe 12,500 years ago. Which might sound impressively ancient from our point of view, but is relatively young for our species. Those first gods would be much closer to us than the first cave art we made. Love thy neighbour – Why did a deity evolve? So, we have a fairly good idea about when and how moralising gods evolved. As co-operation became more important for survival the ideas which fostered this also became more important. This included belief in a vengeful god, which emerged with increasing social complexity at a minimum of 5,000 years ago, but potentially much earlier. But how does a vengeful god help a society co-operate? Whitehouse et al. think it might not be the god itself, but the “doctrinal rituals” associated with them. These formal religious ceremonies might be a way to reinforce social bonds and create a sense of group identity. These rituals also predate gods, so it might be the case that deities are simply an evolution of them4. Others suggest that fear of a vengeful god might keep troublemakers in line. Research has shown that reminding people about deities also makes them more likely to behave. Perhaps these beliefs make you more generous (at least to other members of your religious group). Ethnographic work shows people from societies with a vengeful god give more to other groups that also worship their god. In early society, when crop failure was a constant threat, having a support network was vital for survival5. In reality, it may well be some combination of these factors; and more. People, and their beliefs, are complicated. Ronen, A., 2012. The oldest burials and their significance. 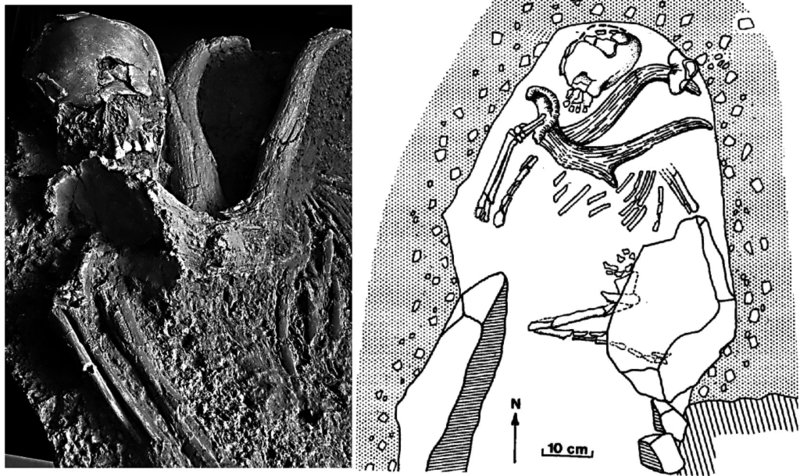 CAMBRIDGE STUDIES IN BIOLOGICAL AND EVOLUTIONARY ANTHROPOLOGY, 1(62), pp.554-570. Murdock, G. P., & White, D. R. (1980). Standard cross-cultural sample. In H. Barry & A. Schlegel (Eds. ), Cross-cultural samples and codes (pp. 3–43). Pittsburgh: University of Pittsburgh Press. Lang, M., Purzycki, B.G., Apicella, C.L., Atkinson, Q.D., Bolyanatz, A., Cohen, E., Handley, C., Kundtová Klocová, E., Lesorogol, C., Mathew, S. and McNamara, R.A., 2019. Moralizing gods, impartiality and religious parochialism across 15 societies. Proceedings of the Royal Society B, 286(1898), p.20190202. Previous post: How were the first cave paintings made? Surely gathered ‘data’. But it’s a rather appropriate typo – gathering dates, on a post about foraging for food 🙂 Happy 100th post! I am very much interested in the future work. A summary look at the few religious context i know (including, and especially current ones), it seems pretty clear how much God (and religion) is a reflection of the way society sees itself. The only real issue is “what to do with the accumulated baggage”. The most prominent baggage being that for some of the biggest religions god is an actual person… which implies a certain amount of inflexibility… should people decide to replace the word “god” with say, “greater good”, I think even atheist could go along. For example, “greater good” demands that we treat our neighbors with respect, “greater good” demands we not steal, or kill, or “covet in your heart” (because it is likely to make you do something against “greater good”). Indeed, there are (if I recall correctly) studies where they looked at how the brain behaved when they asked someone what they thought, what someone else thought and what god thought. The patterns of what god thought most closely matched their thoughts more than someone else’s. God was in essence a part of them, hence why so often the belief tends to reflect the individuals and why there is so much baggage. This is why a secular nation with freedom of worship can be so good. Religion can continue to exist – quite happily in fact – but it is prevented from becoming entangled in government and thus gaining the power for all the negative aspects of the baggage to emerge. It also means that should religion ever vanish we will not be loosing a crucial piece of society. Is it really possible to seperate religion from state? After all, if religion remains significant with regard to an individuals sense of value, and politicians are derived from society as a whole, or would only non-religious people be elected. Is that even possible given that religion, as denoted by the origin of that word, is about the human endeavour to reconcile ones self with the cosmos emotionaly and find security within the uncertainty of existence and apparent certainty of death. It’s certainly a complex issue, but I don’t think it’s an insurmountable one. After all, just look at how the religious landscapes of almost any country you care to name has changed. at drawing conclusions based on such a narrow field of study. I am surprised that you did not have much more comment on this article. I think understanding this facet of our lives- for the sake of the worlds future- is as crucial as coming to grips with earth warming. there could be proof of an evolutionary escalating level of consciousness in primates. Just this small factor in our evolutionary past could have had the effect that a” better” god concept developed/grew amongst some (more conscious) humans (more than amongst others) and therefore they developed more stable societies? In other words, the more complex societies could be the result of a” better” God concept and not visa verso like you conclude? Now i am going to use the Christian “phenomena” (as it is the only religion i know) as an example. We know that the human evolved via basic primate (animal) phases. We know that, today, humans still have to many real animal like traits ( which threatens many societies). If one looks at the Christians guide to a better life (Scriptures)objectively (and only at its essence) then a very strong impression is left that it has been “designed” to negate/neutralize the very animal like behavior imbedded in the instincts of the human? And it seems that that influence, and that influence alone, has propelled us into the space age. Seems obvious that where Christianity took hold, more prosperity developed than anywhere else? over a very wide field. I didn’t get your link, I even checked the spam filter and that didn’t eat it so sorry about that. Perhaps you could try again but in the mean time I can’t really say much about your idea regarding increasing conciousness. However, I can say that your ideas regarding religion preceding (and causing) the social change are without evidence. As I elaborate on in #2 of this article all the temporal evidence we have indicates that the “religious revolution” occurred after the social, technical and economic changes of the Neolithic Revolution. On top of that, the implication of your line of reasoning is that those cultures without a “high” god are somehow “conciously” inferior. This is getting into very murky scientific and ethical waters since there’s precious little evidence to suggest one ethnic group is less intelligent than another and whenever someone has tried to make that claim it doesn’t end well. Finally, I’d like to point out that society is a very complex beast and identifying one cause responsible for its changes is nigh impossible. However, I doubt Christianity makes the shortlist. Cultures have flourished without Jesus, even reached space without it. Whilst it has clearly had a very strong and important influence on our society, to claim it is “that influence alone” which is responsible for advance is simply wrong. i could never really come to grips with the theories of the past.But study of archeology – understanding that we have been created via a process of evolution – the human seems to be less complex. The large primates behavior and physiology being so similar to ours and today being studied so carefully. Even our dietary problems could be related and studied via the primates. does that relate to (and as far as i remember,psychology teaches that awareness(consciousness?) develops in a human as it grows up) our developing a god concept? could also be better then,increase IQ and so forth? that it is the factor that increases our level of consciousness. An IQ test is good at measuring IQ but whether that is also a measurement of intelligence is difficult to say. Particularly given that we don’t have a good definition of what intelligence actually is. Whilst we do have a vague, nebulous idea of what it is we don’t have a specific concept that’s properly testable in humans. When combined with the fact that there are cultural biases in IQ test – Westerners perform better on tests made by other Westerners for example – and newspapers have a strong bias towards sensationalist (and often bad) science reporting it’s enough to make me skeptical of your claims. Allow me to present my response to your attempt to deny God. Except that’s not really your response is it? Most of it is quotes from elsewhere. If you do want to reply then I happily welcome it, however it must be your response. If you do another mass copy and paste of someone else’s work then I’ll just delete it. Reading the blog post, I see no attempt to deny god. Obviously, the existence resp. non-existence of a supernatural entity is independend from humans believing in him or not. One could do similar research for, say, math (“which kind of culture is more likely to develop higher math”), without disproving math. If someone wants to argue the case that this article is part of some dastardly attempt to deny god then they can try. They’d be wrong, but they’re welcome to try. Yes, I’m a Christian. Loved this article. I’d always thought that atheists were anti-society, and now there’s a research paper that supports it. Even at peak complexity the number of societies which had a belief in a moralising “high” god only reached ~40%. There are clearly ways for co-operation to be fostered without religion, so the notion that atheism is inherently anti-society is inherently flawed. It is clear to me that a bunch of beliefs are required to to keep a complex society operational but it is certainly not at all clear that those beliefs must be religious and it is clearly counterfactual that the religious beliefs must be Christian. We have useful beliefs about all sorts of things that aren’t specifically religious. We believe in money – that certain coloured pieces of paper embody enduring exchangeable value. This myth only works while we believe it and evaporates in times of hyperinflation. We believe in property ownership but a moments’ consideration will demonstrate that this is a fiction created by humans. This works too – while everyone believes it – but history demonstrates that ownership conventions can disintegrate. We believe in democracy, that our individual act of voting changes something. We believe in civil discourse and use violence as a last resort. And so on. The domain of religious belief is typically only a small part of the binding beliefs of a society and a lot of people can interact and thrive without any specifically religious beliefs at all. In any case, your logic is circular, isn’t it? Wouldn’t you want your religious beliefs to be actually true rather than a collection of “believable” myths that have evolved by providing the functional outcome of social cohesion in some human groups? I think that man created gods not the other way round. Gods are whatever people want them to be. I think you’re giving people too much concious control. Even if god is merely a belief, I doubt it was one deliberately invented or shaped by people. No one sat down and said “Let’s have a God. Old and stern looking. Sits on an ornate carved high back wooden chair. Surrounded by little babies with wings, flying around with little clouds.” etc. These beliefs developed with retelling and augmentation, resonating with biological propensities and growing from other cultural artifacts over time. Survival of one idea of God over another is a complex mix of emotional resonance and evolutionary utility. A god that commanded you to undertake random useless life-threatening activities might die out when one that commanded you to support the fellow members of your creed would be selected. No one planned it all, though there may have been some judicious conscious choices like the catholics claiming a papal lineage back to Jesus anointing Peter. Jim Birch, I’m not sure that’s what Adam Benton meant. I look forward to hearing what he has to say. What Jim Birch wrote is what I meant. It was an excellent comment as always. You are not presenting anything on the “evolution” of God. You are only presenting material relevant to the evolution of beliefs about God. The fact that you did not distinguish between the two leads me to infer you do not believe in God. People only have the capability to understand what they have the basis for understanding. If someone came to a foraging group and explained about a “high” moral God, they would be unlikely to understand because the concepts would not be familiar to them. That’s even assuming their language would be able to convey the concept. The opening of the piece makes references to “religious ideas” and throughout the article I talk about belief in a high god (note how god is always lower cased to indicate I’m not talking about the “name” of the being God) and even the title puts “god” in quotes to indicate I’m not talking about the literal thing. I think it’s abundantly clear that this post is only talking about the evolution of beliefs and not the actual thing. A distinction is being made, although I’ve attempted to make it clearer in part 2 to avoid any further confusion. As for people being unable to understand a “high” god, I think the success of missionaries refutes that position. Whilst there are multiple examples of conversions failings for many reasons (including what you suggest) there are also many examples of succeeding quite well (note level 3.2 on http://www.joshuaproject.net/progress-scale.php). If there is a threshold, i.e. below the threshold 0% have a “high” god and above it ~40% have a “high” god, then I’d say that the data suggests the threshold lies between 1,000 – 9,999 members. Wouldn’t it be between 1,000 – 99,999? NEEDED???? Fewer than half of these complex societies employ a belief in a judging deity. Most maintain in-group cooperation without the “high” god and its collateral damage: impaired ability to cooperate with other groups and a diminished regard for reason and evidence. We need to identify and encourage cohesive mechanisms that don’t exact such severe costs. True, that was a poor choice of words. I’ve altered the sentence. This, throws up (at least) another question: What is the cause of the loss of religious belief? Conventional thinking is that the religious narratives are obviously weak in comparison to scientific narratives so we go with science. But this data suggests an alternative: that religion is redundant because we have replaced the social control function of religion with other superior mechanisms like courts and police forces, and/or ideologies that imply property ownership and respect for individuals. I really hope religion dies soon. Especially the three Abrahamic desert cults. Ever since the invention of Yahweh/Jesus/Jehovah/Allah/etc it has been nothing but trouble. I suspect the trouble has always been there . Organised religion just added another dimension to it. This is a very interesting post, but I don’t think any of your data is statistically valid. There is probably way too much contamination of ideas between cultures, even during the Neolithic period. Moreover, I estimate that there have been thousands of smaller subcultures so it is difficult to see what your informal survey says. At best, I think, you could claim that there probably is a trend towards a ‘high’ god in the history of western culture. Having said that, the historical facts are interesting and could be used to validate a qualitative analysis, instead of a quantitative, of the history of a ‘high’ god for mankind. I would urge you, therefor, to use your imagination on giving qualitative hypotheses/reasons, since there are many, for the role of religion, clergy, and a ‘high’ god in human cultures. The point of this research was to identify the circumstances which foster the spread of belief in a “high” god, not it’s ultimate cause. Whether it spread to the group via invention or “contamination” is moot, provided the group has crossed the aforementioned thressholds that belief will be more likely to take root. And that provides some key information regarding well…why religion takes root! The secular world doesnot understand the presence of religion in the world today because they reject the source of belief (GOD) and deny that the devil exists and works to lead peoplke to false beliefs. Until you accept and grasp those two facts you will never grasp the presence of religious belief. God said in the Bible that ‘He put a desire to know Him in everyone.’ This means that He has given people a helping hand. Sadly, too many people listen to evil and go away from the truth & God resulting in the many different religious practices since creation. We all “grasp the presence of religious belief” – it’s everywhere. The interesting question is: “Why?” Even if your particular religion were objectively true, the question of why you believe it is still very interesting. People believe all sorts of things – including things about various gods – and not all of them can are true since they often contradict each other. So there is still has to a process or mechanism by which people take up beliefs (irrespective of whether they are right or wrong). What do you think that process is? Your belief that your religion is the one true religion is pretty standard across all religions so I can’t see that it could possibly be good evidence for the beliefs of your particular religion. It seems to be something about the nature of every religion, don’t you think? Answer to your question will most probably be something like:- inherent (processing) structures established in the brain resulting from evolving survival mechanisms. Simply put as a “problem solving mechanism” ? Humans are inquisitive-humans solve problems. With this, one will consider a multitude of other factors. Apparently only 3% of humans are non-conformists. Independent thinkers. 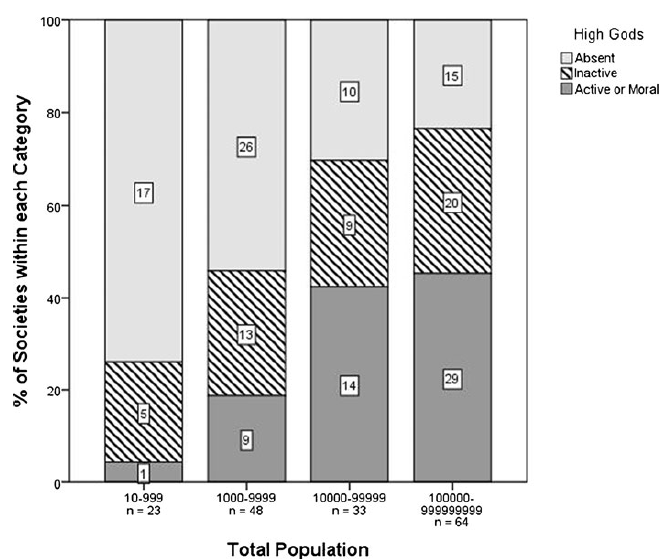 Consider IQ and IQ graphs of a population. Factors resulting in creativity. And possibly something that has come to mind lately:- why are some more obviously inquisitive than others? What will the role our emotions play, be in this. To me the brain is like a sponge with a liquid colorant in it. (Factor of evolution). If you pore clean water into it, it will come out colored on the other side. How do groups influence the humans thinking? Much of all this is understood today. What is interesting to me ( if it is true that religion evolved) is how is it possible that Genesis, for example, corresponds so correctly with what we know about paleontology, geology and archeology today? I am talking about the sequential physical events in Genesis. First darkness, then light, then separation of water and land, and so on ? Seriously? You mean that you can find a few factoids in Genesis that could potential correspond to the real world. Genesis is completely loaded with things that don’t correspond to the world as understood by mainstream science. Try it line by line. Writing anything that is 100% wrong is hard work, just like writing something (nontrivial) that is 100% right, you won’t do it by chance. In science, you look for things that are wrong. Why? Because we have evolved to pick up clues and imagine them into stories. A pawprint might mean a predator is around. It might not, but it’s better to guess and be wrong 99 times to save you life once. In science, we take the slow hard road of examining, testing and rejecting until we finally get it really right. We don’t take the pawprint-equals-predator jump, the quick economical grab at knowledge that we have evolved to use. The few places where Genesis happens to correspond are within expectations of random luck. All too often people go with a hyper-adaptationist explanation which posits that nearly every quirk of human behaviour is some kind of adaptation to the environment. When you ask “why are some more obviously inquisitive than others?” I suspect you think there may be such an explanation. Certainly some people have suggested that they serve some evolutionary purpose, that those “rule breakers” introduce new ideas and this is a crucial part of cultural evolution. At the same time we know that there is natural variation within the human population. People have different eye colours not because they serve any function but simply because there are quirks in our gene pool. Might such non-conformists also be such a quirk with no ultimate function? Certainly I’ve seen no evidence to suggest that they confer some key benefit which evolution would select for (although if someone wants to present that evidence I’d be more than willing to listen). The answer would lie in when the story of genesis was first written and by whom. Who was doing what scientific studies at what periods throughout history. Does what we know about the basic development of the planet require any more intelligence than was around perhaps 5000 years ago? Certainly science doesn’t know everything, after all if it did then it would stop! This list of unknowns does include why religion exists, although as this research shows we’re making progress in the area and are constantly advancing our knowledge. If you want to contribute to this progress then I – and the scientific community for that matter – would certainly be willing to listen to your ideas and the evidence you present for them. That latter part is key. For something to be accepted evidence must be presented for it. However if the only justification you can offer for your idea that God is the source of belief is acceptance that God is the source of belief then all you have constructed is a circular argument that can offer no justification for buying into it. Such arguments are not particularly useful on the quest for truth and must ultimately be discarded. Jim. Try it by line (if i understand you correctly) is exactly what i have done, and you should do if you in any way consider me seriously. I don’t have the time to type out the whole of Genesis and correlate for you now, but just briefly the following. (Please go and read just the first two pages yourself and try and think about them from the following point of view). First there was nothing. Then the explosion. Then earth and the heavens and light. Sounds to me like the “big bang” and what happened after that! Then water everywhere. Is that not geologically correct? Then separation of land and water. Is that not also geologically scientifically correct? Then plant life ? And then life in the water and after that life on land. Humans last! Far as i understand that is pale-ontologically and archeologically correct? All of this seems to me to be in the same sequence scientist determined?. My question is just:- How could “barbarians” 2000 years ago have known this is what happened? Does that insight have anything whatsoever to do with the relative size of a society? On top of all this it is stated that “a day is like a blink of an eye”. Random luck. No way i can concede. Besides science humans evolved one magnificent attribute. Logic. And i think scientists mostly have to postulate a problem before the search for the answer develops. Adam. I had an old ,uneducated, friend that taught me :- if a problem is to complicated-be it whatever- simplify it. Is IQ not essentially ones ability to resolve (survival) problems? I definitely agree that there are different problems.basically,i suspect,technical and and social problems for primates? I know little about today’s tests but suspect specialists are very aware of what you said and will attempt to compensate? Where i live some newspapers have scientifically based articles. IQ measures the ability to understand relationships and solve problems, amongst other things. Whilst it’s unlikely being good at these things will be detrimental to survival I don’t think they’d be directly useful either so calling it a measure of ability to “resolve survival problems” is a bit of a stretch. Besides, even the best newspaper article won’t be as good as the original research. When you compare Genesis to reality you’re missing out some key things. Like how the earth was created before the sun, which in turn was created around the same time – if not slightly before – other stars. Contrast this to the fact the earth formed in orbit of the already existing sun, which in turn is a 3rd generation star that appeared long after many others. And then we have plants being created before the sun as well and birds being created before the land animals from which they really evolved. You can only align Genesis and reality if you stop investigating when you find the answer you want. Even a little bit more digging will reveal significant contradictions. Wrong. The physics of the so-called “big bang” is not fully understood but it doesn’t imply that there was *nothing* before the big bang. The current understanding is that there is no “before the big bang”. Time started at the big bang. This is a bit hard to get your head around because you are are a biological entity with a built-in concept of time based on the second law of thermodynamics. Time as understood by physics often corresponds to your idea of time but not always, and definitely not at the big bang. The term “big bang” is regarded as an unfortunate metaphor by physicists, because despite what you may have seen on TV it was nothing like what you would call an explosion. Physicists use the term “inflation” but it’s still a metaphor for something that is wildly outside anything we could experience directly. For the initial period of the universe there was no light in the sense you are talking about. The universe was expanding rapidly but was impenetrable to light until things cooled down enough for hydrogen to form. The earth actually happened a long time after the heavens. It does but this is a chicken and egg issue. The big bang is popularly described using metaphors like genesis because it is so weird. But it was really quite a different kind of thing. No. The earth’s water has built up over time. There was some water early on but more LATER. Possible sources are it being release from rocks, from icy meteorites and from protoplanets that hit the earth. This isn’t known. It’s very vague. Is it saying that water came from the minerals in rocks, or that it was all mud at one stage? There is no mention of the importance of extraterrestrial sources of water. Is Genesis specifically denying that there is an extraterrrestrial component of the earth’s water. No it was bacteria first. Plants came later. More or less. It’s true that we are very late in the evolutionary sequence but we aren’t the last things to evolve. No. For a start, didn’t the Genesis version take one week? Not 14 billion years. If I recall correctly there is no mention in Genesis of humans evolving from bacteria to sea floor worms to fish etc to hominids to modern humans. According to Genesis we were created as is. This is really badly wrong. They didn’t. We still don’t know all of it, but it is now absolutely certain that what is described in Genesis didn’t happen. If humans had had to actually think their own survival we’d be dead. Do you actually know how digest food? Fight disease? Imagine if we had to build our own offspring: Once in a thousand years a small piece of fingernail would be born! We are automated systems for 99% of what we do. The next source of behaviour is habit and stories. Finally, there is a little bit of thought. You survive without thinking overnight but try going one minute without your heart beating. Genesis might contain a few statements that taken in isolation correspond (in a vague way) to what is established by science, but so do the creation stories of other religions and so do books of fairy tales. So do computer programs that make up random sentences. This is a definitely not a good level of evidence for what you seem to be implying, that somehow the writers of genesis knew stuff that wasn’t discovered by science for thousands of years. If you add up what they got right and compare it to what they got wrong, and to, what they completely missed, I think you’d find it was with in the bounds of dumb luck. There’s no need for a supernatural explanation. There’s a saying in science: Annecdote does not equal evidence. This means that if you cherry-pick your data points you can “prove” almost anything. Finding a few correspondences between Genesis – or the Epic of Gilgamesh, or whatever – might be interesting but, from a science point of view, that’s all. Science always tries to find all the evidence and use it equally, not to select data points that support a particular case. You are assuming that everyone were ‘barbarians’ 2000 years ago. There was high mathematics, astronomy and logical deduction etc were already highly evolved in some societies in those days if im not mistaken. I agree 100% with what you say.Very well put. One of the “issues” i seem to recollect is that there was morning and evening before the son was “created”. But are all the elements of creation not-in an elementary manner, i agree- contained in Genesis? There really is more than one discrepancy. But that really is not the point. Point is that, for how long has our scientists had the basic knowledge of how our universes ‘creation’ actually happened? Big bangs, expanding universes. Possibly 11 parallel dimensions. Possibly parallel universes! Dark matter, and all that. A hundred years? What mechanisms did we have to assist in coming to the present day conclusions? What were the every day circumstances of those who wrote Genesis? How many thousands of years ago did they understand the basic “concept” of this ‘creation”. Did they even have the wheel then? The “time line” seems so close to the scientific one, that to me its seems even – unreal. Unbelievable. Even more so the fact that this “story” was somehow notated and preserved for so long. How many times would you imagine it was altered? How did those people know that first there was no light, for one?Do you think they could imagine one billion years? Once one grasps the reality of the primary conclusions of archeology, your personal reality, pertaining to the relativity of time, changes. I think . Objectivity could be a shock. Is there the vaguest possibility of Christ being cloned today and literally returning? That is what i mean by a shock. Science fiction? There is today a very famous American artist by name of David Leffel who stated:- it is not” in sight” that matters, but “insight”. Obviously there will be some structural parallels between science and Genesis since they are ultimately both explaining how the current state of affairs came to be. So it’s only natural that both tales will include various features being either absent or different, there’s nothing spooky about that. What would be more interesting is if there was a deeper relationship between the two, beyond the almost predictable parallels that arise from the fact they’re telling the same type of story. However, as Jim and I have explained this is not the case. All of the links between the two stories are very superficial, collapsing under any scrutiny. I appreciate both your responses as they are constructive. Please take note though that i don’t look at the TV as i don’t own one and am not much inclined to waste my time. The net though, i consider one of the biggest bonuses of this life. Jim should read on The Templeton Foundation. I am definitely not an expert in either of these two fields we seem to be discussing. Read Jim’s response carefully but cannot say that i can gel with it. Feels like one is discussing a difference of opinion in two different languages. Or Jim does not read me carefully. Or i express myself very poorly. bring up the issue of ” one week or 14 billion years” is beyond my understanding. Are you lecturing the kinder garden? And “no mention in Genesis of humans evolving from bacteria”. This just to take two points as an illustration. ( By the way, do you know that it is written that Adam was made of mud- and what do think that implies?) I associate mud with bacteria,viruses, amoeba, fish that crawled onto land and so on. In this context. “Obviously there will be some structural parallels”. That is exactly what i am saying Adam. Only, i really cannot see that it is obvious. How can you explain it as obvious? Obvious,but not “under any scrutiny” ? I maintain,there are these amazing parallels. (Don’t split hairs with details!). Parallels notated by peoples removed approximately 20,000 years from Neanderthals? If I invented a story about how light appeared it would start with light not existing, or existing in a different state to the one it is currently in. It’s a necessary aspect of the story – for something to be invented it must first not exist. Similarly if science is explaining the “invention” of light then it would also have to follow the same basic structure whereby at the beginning of the “story” light does not exist. As you can hopefully see, by virtue of the fact they’re following the same basic format there will be some parallels between the two explanations. But that’s nothing special unless the connection is deeper than this fairly superficial one. But it isn’t. There are parallels, sure. Amazing, I don’t get. My claim is that you are cherry picking. You should look at each claim (not each “interesting” claim, that’s bias) that is in Genesis and evaluate it individually. Give each claim a rating of from 0=weird to 10=well aligned with current science. You’ll find a low of low numbers. I don’t see that anything you’ve come up with rates higher than 5. I’ve also read the creation myths of some other religions too. They are quite different narratives to Genesis but they also have some “amazing” parallels. Does this prove that they also are created with divine guidance? A few interesting parallels and a lot of stuff that is clearly wrong or just plain weird doesn’t prove much. Remember that a random sentence generator produces a lot of correct propositions too. In fact, if it is run long enough it will generate any and every true proposition. Amazing? No: chance! Suppose you were indifferent to Christianity: Would you find Genesis amazing? I don’t think so. You have an emotional need to have the Bible affirmed and it is interfering with your ability to analyse evidence rationally. Genesis might be an interesting or even beautiful narrative, it may contain some strong emotional resonances, poetic “truths” if you like, but science? Sorry, no. Adam. “If i invented a story”. That is exactly what i am talking about. If you lived so many thousands of years ago, would you in any respect have thought,been able to think,like you can today? Like Jim says, try that with a 1to 10 scale. I think you would be hopelessly off the scale? Sorry to put it like this, but just try and imagine the realities of then. How could they have known that first there was “nothing”? One could test this with uneducated uninformed people of today? I think that everything we create already exists-in its abstracted format. Show me one thing that man has created out of absolutely nothing? We can do nothing more than manipulate the elements of this universe? I do however, have a theory that whatever we can imagine, we can concertize. From Jules Vern on this seems to me the case. But, i don’t think we can imagine anything from a state of no knowledge,no info. How long did it take for a simple implement like a bow and arrow to appear? The wheel? How could it ever be possible that they followed “the same basic format”. that is what i would like to know. Jim.” There are parallels”. If you and i and Adam together could come to a rating of 5 on these questions, i would think we would be doing “amazingly” well ! “Cherry picking”. You are again 100% correct. But definitely not with a disposition as to justify my points of view.There is just to much info available today to be (1) capable of all sciences (2) to collect all conclusions scientists come to and acquire a detailed knowledge of all religions. It is not possible for one person anymore. “Divine guidance”. You said it,not me. if you told me the pyramids were built 4000 years ago and therefore certain knowledge was available, i would have taken you seriously. Predisposed to Christianity. I really don’t know what to answer you. Possibly ,yes, to the essence of Christianity. But possibly i now know with what color lenses you are trying to asses me. Everyone knows that Christianity is in a lot of trouble today. And if you are a little informed, you can understand why. Primarily, i think, because they don’t fully respect Gods creation.There is simply not enough humility around. If ones conclusion is that god created via processes like evolution, “big bangs” and such, if one half (count of 5) understands that, time wise – what “is was and what was is”- (you said there was no time before?) then all of this we are talking about is a lot more than even magic(now for the lack of another word). I know enough about psychology to know one is inclined to be emotionally biased and to try and logically counteract that. And that humans are constructed to generalize. But then i also know enough, and have seen enough, to know that the best scientists are also human. As little as any scientist can say there is no God, so little can anyone (such as myself) say there is definitely a God of such and such nature. I think the Scriptures are grossly misunderstood. That there is a lot more to it than meets the eye. That it was evolved to meet the demands of different times and that we have not gotten to the bottom of it. Also that we should keep on looking. If you think i am a Creationist, you would also be totally wrong. we get clobbered. Simple as that. Seems to me that scriptures was given to us animals as a guide. We make it to difficult for ourselves and we are to stupid to understand the essence of it and to value (assess) the essence correctly. I think science is making it clearer by the day. Can you blame me for wanting to know more? Just read on Adam trying to instruct the creationists on “ladders” and “branches”. Do you know that the Bible has a crystal clear verse on that? Feels like i jumped in the deep side now. So your argument basically boils down to ancient people being unable to conceive of something starting? That’s absurd. For starters just look at all the other creation myths, which all follow the basic format a creation myth has to have: first something didn’t exist, then it did. Not only that but many of them are more scientifically accurate than Genesis. IIRC, the Egyptians believed the earth accumulated from a cloud (an idea not dissimilar to the accretion disk the earth actually formed from) whilst some Greeks believed that life arise via natural selection of sorts. And hey, they couldn’t have worked out that things can have a beginning so maybe you should go worship those miracles. Still doesnt explain why all we percieve as designed isnt actually just a random coalescence of a chaotic universe, including the proclivity of most of us to wonder about it. Isnt it possible that there actually is no moral reason for it beyond what we make up and create for ourselves, and that ultimately there is no purpose to creation; that it just is what it is, beyond our self-proclaimed concepts, beliefs, and stories about it. Unimaginable ? Not really, if we humble down our egos and just look at it all, judgement free and in awe of it and the fact that we exist because of it. Adam. I’m a little under the weather and open to the fact that I’m missing something significant. However, these claims seem completely arbitrary and here’s why. A person’s highest authority is their god, whether they are willing to admit it or not. For some people, it’s Reason; to others it’s Darwin; still to others, Yahweh. Regardless of who your god is, that is your Ultimate Authority. Therefore, to place preconceived notions about different society’s motivations based on their view of god seems completely contrived. The tribesman who worships an animal spirit, is appealing and yielding to his Ultimate Authority the same way as a mono-theist or a poly-theist. They aren’t saying, “Boy, if we got ourselves a “High god” we could really push this civilization forward!”. Those are the presuppositions of the two researchers, not necessarily the motivations of these people groups. Furthermore, how many people were in the tribe when Adam walked alone with God in the garden, in the cool of the day? Finally, to assert that only certain people groups had farmers or herdsman and this was based on their concept of God is not commensurate with reality or a study of ancient civilizations. I think the point your missing is that this isn’t about their “motivations.” I’m not suggesting that some people sat around a table and tried to conjure up some belief that would advance their society, simply that the circumstances a particular culture naturally produced fostered that belief. I.e., that a group automatically creates a situation where the “high” god concept flourishes, not that someone decided to promote such a concept amongst the general populace. Finally, if you have a look at #2 in this series you’ll note that farming or pastoralism was the result of their god concept. That emerged when farming etc. produced the circumstances which fostered the god belief. Also, I hope you get well soon. Except that most if those other people dont call their motivation ‘god’ they just call it whatever it is and attribute it to biology etc. So why attribute that to an invisible cosmic anthropomorphic being ? My guess is that religion emerged because of free-riders, not in an effort to get them off their duffs. Let’s say you’re a lousy hunter, maybe have a limp, and not especially good at chipping flint. But, you’ve observed how cowed your cave-mates are by unexplained phenomena, so you claim that the spirits of the animals speak to you, and offer to intercede to produce better hunting. You put on the skin and antlers, do a dance, and if the next hunt is successful, you’ve “earned” your share of food. I think you’ve set the wrong goal (‘…be sure to develop secular ways of ensuring humanity continues to work together.’) – I think we’ve basically achieved that, but more to the point, I think the study misses its target. The ‘Active High, Moralizing God’ correlation to functional, cooperative societies is too weak for it to be significant. Less than half of the groups larger than 10,000 have this condition. What I think is possibly significant is the pastoral connection. I’ve not dug up the data used by the authors, but my own observation is that modern & historic communities with active gods speak a language from a traditional pastoral origin: Indo-European, Altaic or Semitic. So it looks like a cultural holdover – Active pastoral groups chose active gods, settled agriculturalists chose passive gods. Pastoral conquerors imposed language and religion on many of today’s intensive agricultural societies. Certainly the influence of conquering pastoralists would be interesting to look at and there are several notable examples from history, particularly in Mesopotamia. However I don’t think we can ignore the effect of population size. Whilst clearly not the only influence on the development of a “high” god (and I don’t try to suggest that it was) it does still appear to play a role. Have any new studies come out regarding the origin of moralizing gods? Specifically I am curious if the larger economies of larger societies were necessary to be able to support professional religious leaders who then invoked all the attendant “high” god moralizing, expanded rituals, and beliefs? And the smaller economies just could not support the potential full time religious leaders who were waiting for the chance to give up their part time self support activities? Commas are the difference between ‘the prevalence and importance of these religious ideas’ and ‘the prevalence and importance of these religious ideas studying them’. Commas do not double as semicolons, Adam. ‘That said the picture is still not complete.’ *What* said the picture is still not complete, Adam? Hi Adam. Are you still out there ? I wonder if the origin of the anthropomorphic ‘high god’ concept could have developed over time as hominids gradually became erect. Whereas previously they would have been absorbed with rummaging around with their hands, becoming increasing aware of what they could do with them compared to other creatures, while becoming increasingly aware of their surroundings, thus coming to a conclusion that everything they saw must have been manipulated into being by the hands of something like, but much greater than, themselves. Having this belief develop so far back in the past would imply it would be present in all subsequent groups. The fact variety exists within present groups challenges this and suggests the “common ancestor” of high gods was more recent.